During a visit in Australia this week, International Olympic Committee (IOC) President Thomas Bach made it known that the IOC would not accept a joint bid in any form. The argument for a joint bid from Melbourne, Sydney and Brisbane was reportedly put forward Wednesday by former Victorian sports minister Justin Madden who helped oversee the 2006 Melbourne Commonwealth Games and was backed by prominent businessman and major events expert Ron Walker, who said Olympic bids were too expensive for one city to justify. Late last year the IOC passed Agenda 2020 – a set of charter reforms that in part called for the low cost, sustainable organization of future Games. In order to help achieve this goal, the IOC said they would relax the venue siting expectation of a compact plan. In some cases, it was said, individual venues could be held in another city – or in exceptional circumstances another nation. These changes have opened the doors to more creative plans from various nations who may have been unable to meet expectations in the past. In December the IOC itself suggested that PyeongChang 2018 halt construction of its costly sliding venue to instead hold bobsleigh, luge and skeleton in Japan. Korean officials refused. But based on Bach’s remarks, it seems that he and his IOC are trying to rein in any possibility that the use of widespread plans get out of control. 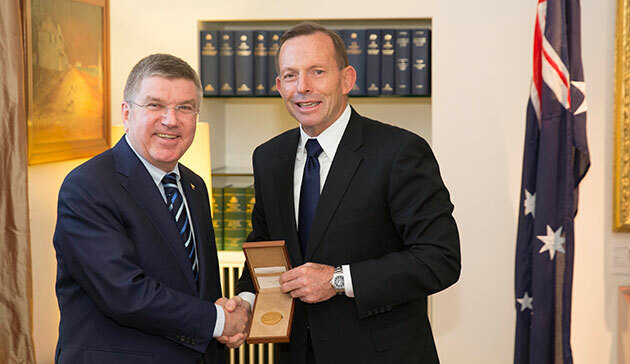 Bach met with Prime Minister Tony Abbot in Canberra Wednesday and discussed a regional bid for the 2028 Summer Games which would see both Brisbane and the Gold Coast host Olympic events, but although he indicated he supports the concept, Bach said it was out of the question for a Summer Games to be hosted in three major cities like Melbourne, Sydney and Brisbane as advocated by Madden and Walker. Madden said Melbourne, Sydney and Brisbane could be linked by high-speed rail, making a Games hosting possible in his vision, provided the infrastructure was in place. Australian Olympic Committee (AOC) head and IOC vice-president John Coates and Bach met with Sunshine Coast mayor Mark Jamieson in Sydney on Thursday and following their discussion, which also involved Brisbane Lord Mayor Graham Quirk, the AOC head said, “we talked about the feasibility of a regional bid which is within 100 km radius around Brisbane. It was clarified that really there will be one village, there will be no breaking from that and that’s critical to the IOC. “As for having a bid that covers other cities, that’s totally ruled out by the president,” Coates said. “You can go to other venues for reasons of sustainability for preliminary competitions, but really we want one Olympic Village for the whole of the Games, and for all of the 10,500 athletes and all of the 205 nations”. Earlier this week, Bach said that he supported an Australian bid for the 2028 Olympic Games for which applications will not be accepted until 2019.